So is January off to a great start, or what? Because once again, the markets bounced all week and gave bulls plenty of opportunity on the long side for the fourth week in a row. Of course, the question now is… can it continue? That’s why I’m excited to dive deeper into the price action this week to try and determine if the coast is clear, or whether this is an ongoing bounce in the context of a deeper correction. 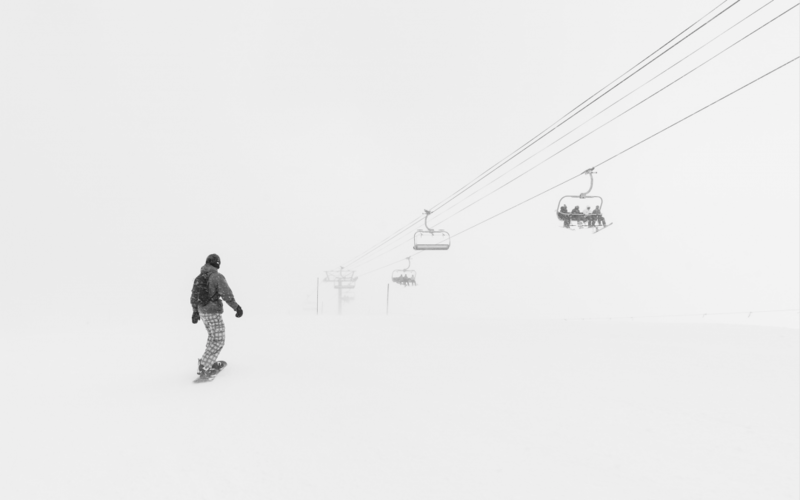 First then, let’s recap the big picture trading action this week and then dive into some specific stock charts that look like they might have the potential to keep trending. Sound good? Coming into 2019, I think it’s safe to say bulls were on the hind foot. Because after the sharp and fast third-quarter correction, it looked like sellers had the momentum heading into the new year. But as it turned out, those sentiments were misplaced. Since then, buyers have come in off the sidelines to relentlessly bid stocks higher. 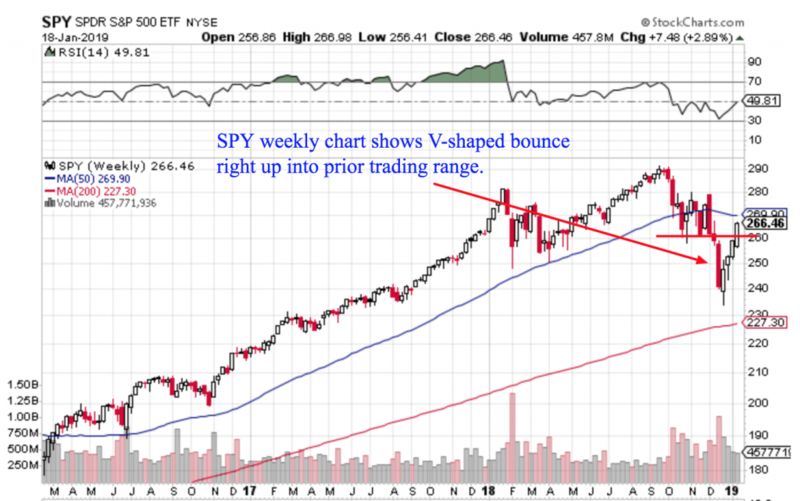 And I think you can admit, this recent bounce in the indexes (as shown by the SPY ETF below), has a very strong “V-Shaped” look about it that’s been the hallmark of so may other short-term bottoms in this bull market. Nobody knows what’s going to happen for sure. But as long as you have a positive-expectancy system I don’t think you need to predict the stock market. Just accept what’s happening! And for now, that’s higher prices. On the other hand, I think there’s a fair argument to be made that stocks are a little bit extended short-term. 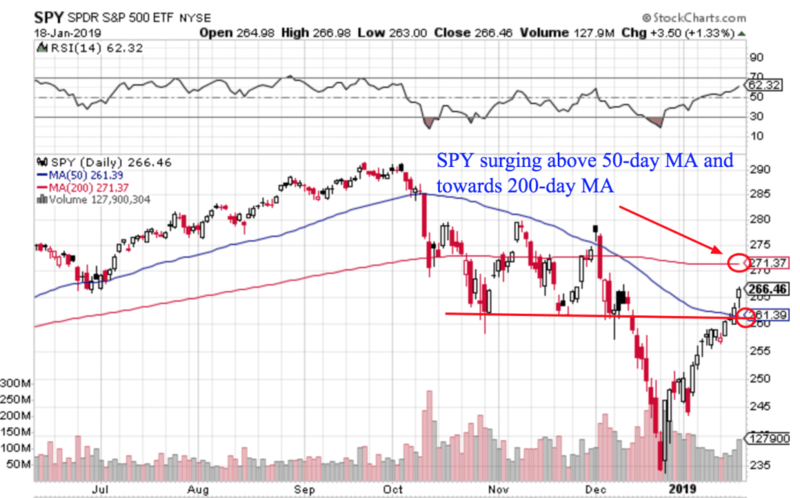 So zooming into the daily chart of SPY, while the recent candles look constructive, I wouldn’t be surprised by some resistance around the 200-day moving average. And actually, I think bulls could benefit from a tight sideways consolidation in the coming days to help regroup before the next leg higher. In contrast though, if we do see selling pressure I’ll be quick to cut my losses because I always have a plan for when to sell. 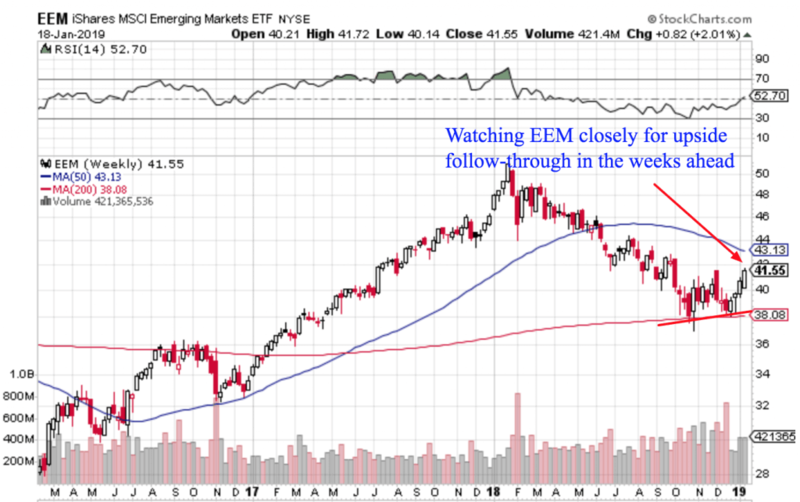 As you can see in the weekly chart below, the EEM ETF also finished the week at a 3-month high. So could this change of character provide a potential driver for 2019? I guess we’ll soon see. Now the other wildcard that’s currently in play is earnings season. I think the good news is, even though many companies and sectors (like the financials) have missed earnings, the market has continued to rally anyways. Not a bad sign for bulls in my opinion. Be aware that trading through earnings can have a material impact on both your returns and the volatility of your portfolio. Here’s how I approach it. But be sure to give it some thought based on your own trading or investing style, and please double-check earnings dates for the ideas below. 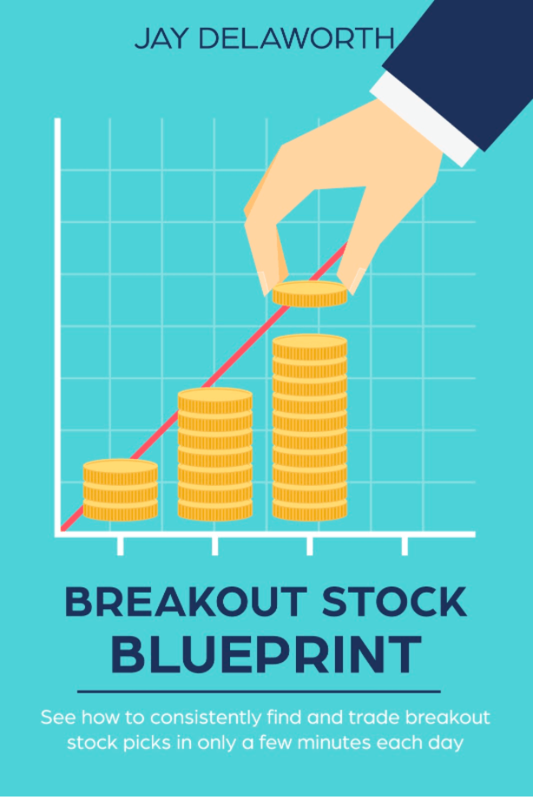 Now with that context top of mind, let’s dive into some specific stock charts that are looking promising as we head into the back half of January 2019. 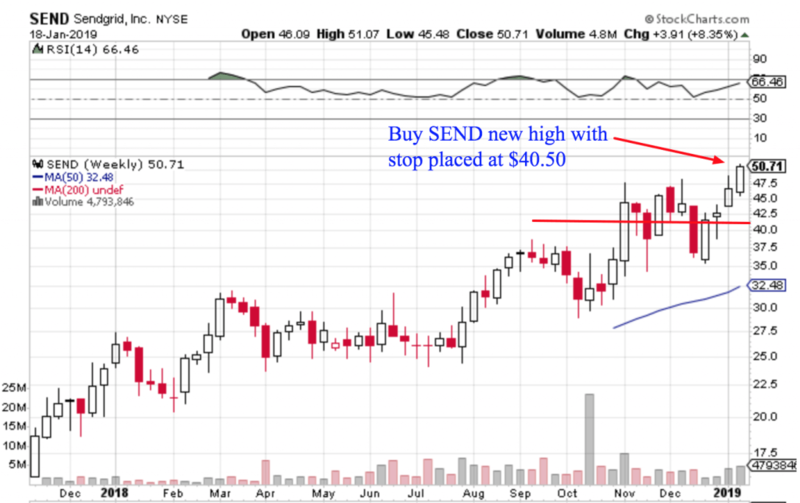 Not only is this stock putting in a new weekly closing high but, it’s also done so on pretty strong buy volume. The one caveat here would be to keep the position size smaller due to the volatility of this ticker. The other great thing about this chart is the way price isn’t too extended yet from the consolidation zone. In fact, I’m cautiously optimistic this ticker can continue trending higher. The smaller float on this newer stock might also help add some fuel to the fire. 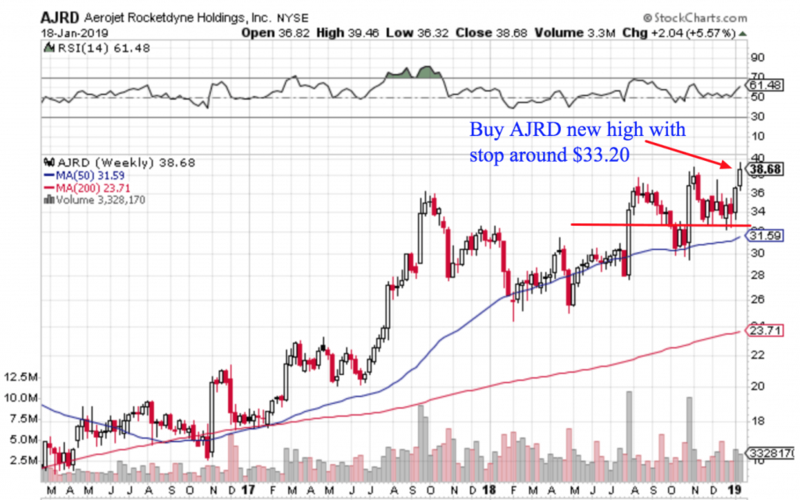 Another ticker that has my eye at new highs is is Aerojet Rocketdyne Holdings (AJRD). This one also ended the week higher after a bit of a consolidation. 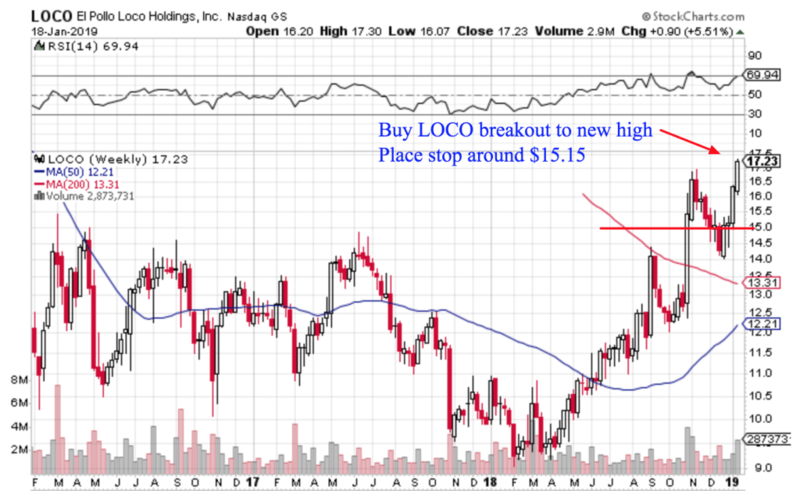 One of the things that really stands out to me about this stock is the way the relative strength this stock showed during the recent corrective period. So if we see bulls continue to press the envelope this week, I’m optimistic these kind of stocks can participate in the upside. 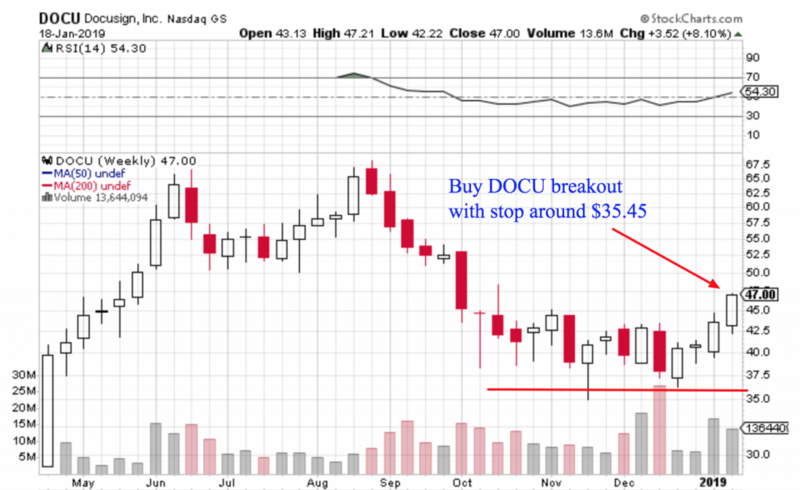 Finally, I also want to show you the chart of another young tech stock that might be on the verge of a new uptrend, Docusign (DOCU). As you can see, DOCU had a bit of a rough go after it IPO’d last year. But the company has a unique product offering, and the stock looks like it might be in the process of carving out a bottom here. With the strong weekly close, I like the risk/reward this chart offers, with a stop below recent lows.